DETAILS: Prices include shipping. 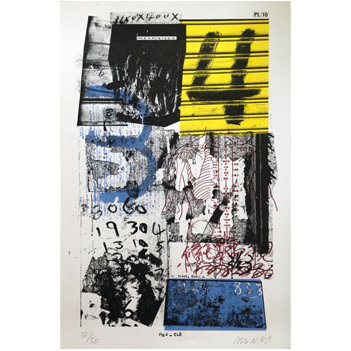 Limited to 50 pieces, this is a first in an ongoing collection of prints, created by Charles Munka. Riso print on munken cream 150gsm paper. Signed and numbered. It's difficult to avoid the blitz of advertisements and city postings in any metropolitan city, especially one like Hong Kong (Charles Munka’s residence). During Munka's research sessions, his eye is always looking for the alternative. This print represents a collage of forgotten, hidden, and discarded details from the streets of Hong Kong. Symbols and markings meant as guides for things like city planning, construction, and population control, that during it's life span, are immediately covered up, patched up, or destroyed. A behind the scenes look of what makes a city like Hong Kong, tick.